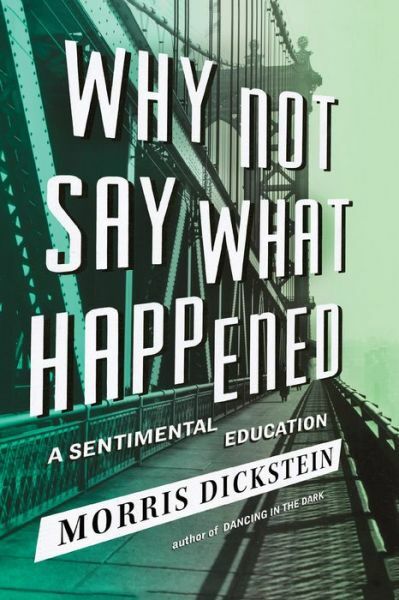 In the foreword of his affecting memoir, Why Not Say What Happened: A Sentimental Education, Morris Dickstein recounts an odd, revealing incident. In 1965, at age 25, he has returned to New Haven to write his doctoral thesis for the Yale English Department after a year at Cambridge University studying literature on a prestigious fellowship and traveling on the European continent. One day he finds himself walking in the deteriorating neighborhood where five years earlier he had shared an apartment with two other observant Jewish graduate students. Uninterrupted, he completes this trespass on his own past and leaves, overwhelmed by complex nostalgia. “The emotions I brought and still bring to this peculiar incident remind me of one of my favorite poems,” which he can never read without tears welling up. This is Wordsworth’s “Lines Composed a Few Miles above Tintern Abbey. . . ,” written in 1798 after the great Romantic poet, at age 28, had revisited a scene on the river Wye that he had first seen five years earlier, and found the landscape both the same and completely altered. To compare a shabby New Haven apartment with its stack of empty beer cans to Wordsworth’s “woods and copses…with their green and simple hue” seems at first grotesque, incongruous, a case of literature in the head, unconnected to deep feeling. But as you get deeper into Dickstein’s Sentimental Education, you begin to see the incident as a measure of how far he has traveled from the confines of his Lower East Side Jewish childhood to a deep understanding of Western culture. Not much of dramatic moment happens in Why Not Say What Happened—words from a late poem, “Epilogue,” by Robert Lowell. A cottage belonging to the author’s parents burns down, thus reducing by one the crowded number of small dwellings at Rocky Point, “a mostly Italian town on the North Shore of Long Island,” where his often-squabbling family spent tumultuous but joyous childhood summers. Dickstein marries his longtime companion, thus provoking a battle between his parents and his future in-laws over whether roast chicken or prime rib would be served for the wedding feast. He is denied tenure as a professor at Columbia, as much because of his success as a public intellectual, one suspects—reviewing for Commentary, Partisan Review and The New York Times Book Review—as for the English Department’s straitened finances. But events don’t matter all that much in this story, except to keep straight the colleges and universities where the author is studying with so many of the notable teachers of the times: Mark Van Doren, Lionel Trilling, Quentin Anderson and Peter Gay at Columbia; F.R. Leavis and John Newton at Cambridge; and R.W.B. Lewis and Harold Bloom at Yale. And of course to keep us readers abreast of the great cultural upheavals that What Happened reports, chews upon and digests: the Kennedy and King assassinations, the arrival of the turbulent 1960s, civil rights, Vietnam, and, right before the memoirist’s eyes, the 1968 Columbia student uprising. What’s impressive is how seamlessly everything in Dickstein’s story connects—his daily life, his studies and his reactions to the books he reads. As a yeshiva student at the Rabbi Jacob Joseph School on the Lower East Side, he acquired both a solid secular and religious education and a love of reading. Exposed to higher literature as a Columbia undergraduate, he learned to read faster and better and to write with facility about what he read. Consuming books, he learned to relate them to the author’s intentions, to his own reactions, and to the cultures to which both he and the author are connected, as well as to how these cultures connected. He wrote his doctoral thesis on the poetry of Keats, who, eerily enough in Dickstein’s mind, happened to die on the same date as Dickstein was born, and with whose acute sense of mortality he found himself identifying. “No real scholar,” as the memoirist describes himself, he eventually applied “the kind of binocular vision I had admired in Trilling and other New York intellectuals, trained at once on the past and the present, the living past as seen through a contemporary lens.” Thus, when the frozen culture of the Cold War was melted by the heat of the Sixties, he was ready to apply his skills to new forms and write smartly about movies, theater, music, pop art and new fiction, whether the author was Jewish (Philip Roth or Joseph Heller) or black (Toni Morrison, James Alan McPherson or Ishmael Reed). True, none of this will come as a surprise to readers of previous books by Dickstein, particularly Gates of Eden: American Culture in the Sixties; Double Agent: The Critic and Society; and Dancing in the Dark: A Cultural History of the Great Depression. But although these works may sometimes seem more dependent on their parts than their whole, in What Happened Dickstein’s acute thinking and feeling are more tightly knit. Briefly flashing back to his school days as a “brainy nerd,” the synagogue star expected by the grown-ups to shine justifies their faith. Whatever their earlier satisfaction, it has been mitigated by the author’s awareness as an adult of an anxiety connected with his need to impress the grown-ups. The memoir connects this anxiety to his Jewish upbringing, and with the help of psychoanalysis with the grip of kosher dietary laws in his childhood and his adult fear of exotic foods, his stomach upsets and crippling panic attacks when faced with the prospect of failure. With such a perspective, one can see, metaphorically at least, how the disparate pieces of the author’s richly felt life all fit together. His Wordsworthian reaction to that New Haven flat could be explained partly as the expression of his subconscious, so that finally one can view that beer-can-cluttered apartment as a storehouse of Tintern Abbey. Christopher Lehmann-Haupt from 1969 to 2006 was senior daily book reviewer, then chief obituary writer at The New York Times. He currently teaches at Columbia Graduate School of Journalism and is completing a memoir, Re-Vision: What I Didn’t See: Berlin, Germany 1947–1948.